If you are of a certain age and persuasion, as I said at the festival, then I thoroughly recommend having a baby. It’s a key motivator in my experience! Even when I was single, traveling the world or working part time, I never got around to even beginning a draft of my much-thought-about novel. And yet, when I found out I was pregnant, it was like rocket fuel: I wrote sixty thousand words (by hand, then typed up in the first phase of revision) in five months. That might sound somewhat impressive, but I met an author on the weekend who wrote her entire novel in five weeks (and you guessed it, she also had two young children). When my novel needed completion, I got pregnant again (okay, not exactly in that order) – but the prospect of having two children under two and still writing a novel was frightening, so I wrote and edited furiously. Furiously. Maybe, after all, there are more parts to my answer. I had a dream, and that dream was to enter The TAG Hungerford Award for an unpublished manuscript. In fact, my pre-birth-of-baby-number-two present to myself was submitting a polished draft to this competition. Some might think a Day Spa treatment might have been a better option, especially as I didn’t win, BUT having this external motivation to complete the manuscript was very helpful. Not winning is hard, though. Before they announced the winner, the five shortlisted writers were asked to prepare a thank you speech. Great if you won, but for those of us who had imagined, prepared, and hoped in vain, it was a wrenching experience. Being shortlisted is, of course, an achievement in itself (there were over sixty manuscripts submitted), and all five of the shortlisted writers in 2014 have since had their work selected for publication, a testament to the great writing coming out of WA. Having a shortlisted work helped me secure an Agent (Fran Moore who lives in Sydney) who was willing to take on an unknown would-be writer from the wild, wild west. She pitched the novel passionately and found it a home with Margaret River Press where Caroline Wood does an extraordinary job of supporting her writers and promoting their work. I always thought my life would change once my book was published. It was a childhood dream, after all. Sure, I was giddy with the news and wept when I told my family but, that first night, I still had to cook dinner, change nappies and put over-tired children to bed. A year later, I still do. And of course, there was the editing process. Wow. I was asked to fill glaring gaps in the narrative (ouch!) and write new scenes – within a short timeframe (and no, it was not appropriate to have baby number three to help me with this looming deadline). I thought I had finished with Beth and Clem, Hope Valley and PNG and here I was, two years later, having to write more scenes for them. I resisted re-writing and felt disconnected from the narrative, worried the new scenes would seem contrived. But my editor, Susan_Midalia, was wonderful – her encouragement, suggestions and rigorous thinking greatly strengthened the work. I enjoyed the collaboration immensely. Because, at the end of the day, while writing might be a solitary sport, we need a whole cast of people to help bring our creative vision to life: the agent, publisher, editor, designer, proofreader, mentors, early readers. I needed a whole cast behind the scenes as well: family and friends who offered to help with child-minding or who just kept asking me how the project was going over the years, were lifelines. So was living in the country – fewer distractions and excuses for not writing, and I was able to retreat into nature to think of new ideas, edit in my head, or take a break. Writing as a new mother forced this would-be obsessive perfectionist to keep perspective, keep thinking big picture, and not feel all-consumed by the project or how the work might one day be received. I told someone at the Perth Writers Festival that Bloodlines is like my third child; that my sister once said as soon as we birth our babies, so the process of letting them go begins. It is with a heavy dose of excitement, trepidation, exhaustion, and gratitude that I finally let Bloodlines go. 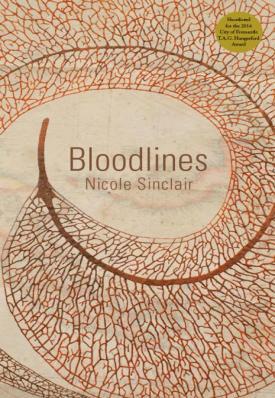 Nicole Sinclair’s short fiction and non-fiction has appeared in the Review of Australian Fiction, Westerly, indigo Journal and Award Winning Australian Writing, and also forms part of the artworks along Busselton Jetty. Her short stories have won the Katharine Susannah Prichard Short Fiction Award and the Down South Writers Competition. Nicole has lived and worked in Papua New Guinea and now lives in the south-west of Western Australia with her husband and two (very young) daughters. Her first novel, Bloodlines, was shortlisted for the 2014 T.A.G. Hungerford Award, and was published by Margaret River Press in March, 2017.